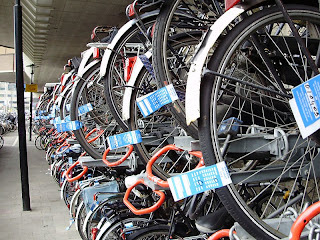 It is often noticed that the huge cycle parks in the Netherlands seem to be full of abandoned bikes. There are two reasons for this. Firstly, people who regularly leave a bicycle at the railway station will often keep a tatty old bike for this purpose because of the risk of theft. These can look like they are abandoned. Secondly, there are also genuinely abandoned bikes. Generally it is not allowed to leave a bike for longer than 28 days at such a cycle park. The cycle parking has to be open 24 hours a day, every day, so bikes can't simply be removed at a particular date. Luckily, there is a simple way of separating the wanted bikes from the abandoned ones. 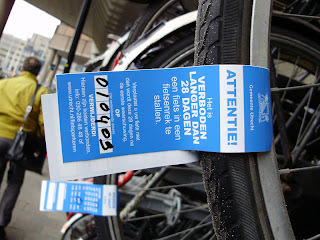 Labels like those shown are attached to the bicycles showing the date on which they were placed and the date on which bikes which still have a label will be removed. As ever, there are some important details in the way in which this is done. The labels are designed so that removing them breaks them. This is important. Cambridge once had a similar scheme, however the labels were attached just by rubber bands and could be moved from one bike to another. That's not good enough. 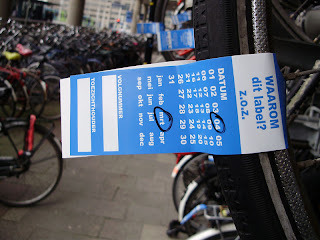 I once left a bike for 5 days and returned to find that a label was on my bike saying it had been there over two weeks and would be removed the day before I returned. It's just as well that they were inefficient and had not removed my bike, as otherwise I'd have found myself without transport. So what happens to the abandoned bikes? Here in the States, they would eventually be auctioned off. Adrienne: I believe the decent ones get sold, but the unsellable ones get recycled. I think it's a very good system, because otherwise abandoned bikes pile up and end up blocking all cycle parking. I think that is right David, but they even allow a certain period in which you could collect your bike. Hi Mark: As you can see, I used your photos at last. I've a blog post about the crisis in cycle parking, and the plans for expansion already written and coming up in a few week's time. I think it's the Danes who call this a "Cykel Vultuur". Good name!